Used bar stools can be given a green makeover to make them like new - or even better! There are so many things you can do to make your home a greener home. When it comes to furniture choices there are plenty of options for recycling and refinishing old items to give them a new lease of life. Here guest writer Caroline Smith of Get Bar Stools outlines ways to save money on bar stools by revitalising used bar stools to give them a new lease of life. Please note some readers may consider this article as advertorial. No money was paid for the article but the interests of the writer may be served by some aspects of the article, for example, by outgoing links. Living an environmentally-friendlier lifestyle is all about reducing your carbon footprint and minimizing your impact on the planet. Although a lot of eco-friendly or organic products cost more than their conventional alternatives, I believe that being green can actually save you money. By this, I mean that it’s not always necessary to buy the latest eco furniture. Before you spend your hard-earned cash on brand new furniture for your home, consider the green living motto “reduce, reuse, recycle”. Reusing an item you already have, or recycling something that someone else wants to get rid of, extends the life of old furniture and keeps it out of landfill. At the same time you can save yourself a lot of money and minimize your carbon footprint. A good place to find second-hand furniture for free – all you have to do is collect it – is your local Freecycle group. The phenomenon of freecycling has taken off around the world, with the aim of putting people in touch with others in their community to reuse unwanted things that would otherwise be thrown away. The Freecycle website is also a good place to re-home any old furniture that you no longer have a use for. As the saying goes, “one man’s junk is another man’s treasure”. It’s also possible to get relatively cheap second-hand furniture from junk shops, garage sales or EBay. If you’re lucky, you might be able to get away with simply giving your used bar stools a good clean, without the need to refinish them. You can save money by making your own cleaning products using natural, non-toxic ingredients that are better for both your health and the environment. • A good way to remove drink stains from wooden used bar stools is to use baking soda. Mixed to a paste in mayonnaise, baking soda can effectively remove water marks. Baking soda mixed with linseed oil can be used to get rid of alcohol stains. In both cases, press the paste onto the stained area using a cloth. Leave it for about 20-30 minutes and then check to see if the stain is still visible. You may need to rub more paste on and leave it again to completely remove the marks. • An eco-friendly way to clean grime and polish residue from wooden frames is to use a solution of 50:50 water and vinegar. • Any patches of mould can be killed by wiping with neat vinegar. • Wiping wood all over with vinegar before you polish it helps add shine. • Once your used bar stools are clean, polish them with the natural alternative to synthetic spray polish – olive oil or linseed oil. Often when you want to reuse old furniture, you decide you’d like to change the colour completely, or you’ll find the old paint is chipped or flaking. Painted or stained bar stools can be refinished in an eco-friendly way using non-toxic products. Conventional paint strippers, paints and wood stains emit VOCs, which can be detrimental to indoor air quality and potentially harmful to human health if the fumes are inhaled. • You may be able to remove the old paint simply by using a scraper and sandpaper. However, as lead was commonly used in paints years ago, it’s wise to purchase a lead testing kit to check if lead is present. If the paint does contain lead, avoid sanding it as this creates dust that can be harmful if inhaled. • An alternative to sanding is to make your own paint stripper. Mix a thick paste of washing soda and water and spread it all over the old finish you want to remove. Ideally, you should leave the paste on overnight so it has time to really loosen the paint. You can then use a scraper to easily remove the paint. • Once you’ve got back to the bare wood, make sure it’s totally clean before painting or staining it. To do this, wipe it using a clean cloth dampened with a solution of 2 parts vinegar to 1 part water. • It’s worth asking friends and family whether they have any leftover eco paint or wood stain that you could use up. Otherwise, you will need to buy a new tin. Try to estimate how much paint you will need and buy the smallest possible tin so as to avoid too much waste. Eco paints and stains are water-based and made from natural plant extracts and minerals rather than petro-chemicals, so are better for your health and the planet. • If you intend to paint your used bar stools, you will need to apply a primer and undercoat before painting with your chosen colour. Cover up or remove any upholstered seats and follow the instructions on the tin regarding application. • Alternatively, to highlight the natural grain of the wood, you could apply a wood stain in your chosen shade. • Another option, if you discover the natural colour of the wood is quite attractive, is to simply finish it with beeswax or linseed oil. If your bar stools have upholstered seats, you could try to clean the fabric to improve its appearance, or replace it all together. 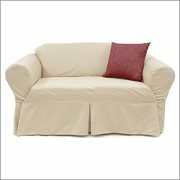 • If the upholstery has food or drink stains, you could try blotting them using cold water or vinegar and a dry cloth. It’s important to blot rather than rub. This is most effective when the stains are fresh, but it’s worth a try if you’d prefer to keep the original fabric. • If the seat fabric is worn, faded or you just don’t like the look of it, see if it can easily be removed. On a lot of bar stools the covers are stapled in place beneath the seats. The staples can be removed using a screwdriver and you could re-cover the seats in your choice of fabric, stapling it in place once it’s smooth. Charity shops are good places to find cheap fabrics. Try to find something that’s fairly durable as well as pretty. Old curtains or denim are good choices. • If your bar stools have solid seats, you could consider making, or buying, some tie-on cushions to make them more comfortable and alter their appearance. I hope that these ideas will inspire you to get creative and have a go at bringing some old furniture (such as used bar stools) back to life in the greenest possible way, saving you money and helping the planet at the same time. Caroline Smith is co-founder of www.GetBarStools.com. She enjoys organic gardening and green DIY projects that combine her love of the environment with her thrifty nature.